I’m not sure in which Circle of Hell Denis Villeneuve went to summer camp, but his movies struggle mightily to make an art of grimness. “Incendies” (2010), set in the Middle East, was the French-Canadian director’s breakthrough, and it was followed by “Prisoners” (2013), in which a bearded Hugh Jackman raged through Pennsylvania suburbs where the sun never shone. “Enemy” (2013) was his idea of an art film, meaning it didn’t make sense because it didn’t have to. God help us if this man directs a musical comedy. “Sicario” is the new Villeneuve, set along the US-Mexican border and pondering with bloody-minded cynicism the futility of our drug wars. It provides a meaty part for Emily Blunt that turns out to be less than it seems, and it’s awash in grime and corpses and despair. Some excellent filmmaking, too — Villeneuve is one of those exceptionally skilled directors who thinks he’s a great one. But let us note the contributions of Roger Deakins, perhaps the finest cinematographer to have never won an Oscar (12 nominations and bupkes), and of composer Jóhann Jóhannsson, whose score scrapes seductively along our nerves. And let us acknowledge that within this dark epic of American failure lives an effective but decidedly minor vigilante flick. The movie starts cheerily enough with an FBI team led by Kate Macer (Blunt) and Reggie Wayne (Daniel Kaluuya) raiding an Arizona drug house only to find stacks of bodies hidden in the walls. Whatever we’re doing to fight the cartels isn’t working, and Kate reluctantly allows herself to go along with Matt Graver (Josh Brolin) and a Colombian “consultant” named Alejandro (Benicio del Toro) on a mysterious cross-border mission. Who are these guys? DEA? CIA? A&P? Better you don’t know. Brolin has matured into one of our loopier movie stars — forget his dad, he seems more like the second coming of Nick Nolte — and he makes Graver a figure of entertaining threat, padding along in flip-flops as he piles Kate onto government planes bound for who knows where. 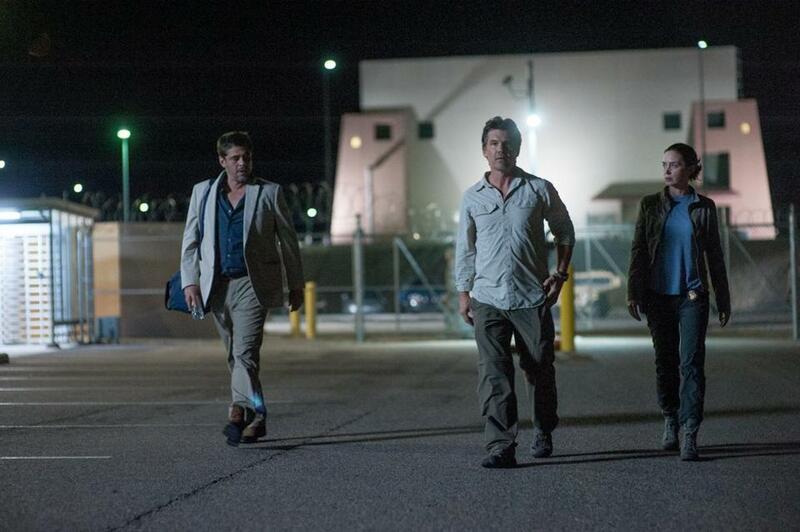 The film’s ultimate quarry is a top cartel man, but there are many bloody stops on the punch-list ahead of him, and “Sicario” stages them for maximum queasy thrills. A sequence at a border-crossing traffic jam builds inexorably toward violence, but it’s the waiting rather than the gunplay that sickens us with dread. A journey through a tunnel beneath the border leaves us gasping for oxygen. Headless bodies dangle from highway overpasses like grisly Christmas ornaments. Villeneuve is currently in the early stages of preparing a “Blade Runner” sequel, but he has already found his future dystopia in the here and now: He calls it Mexico. Blunt discusses her new movie, “Sicario,” being a newly minted American, and the Boston accent. Blunt is capable of just about anything at this point in her career, and those who saw the underrated Tom Cruise vehicle “Edge of Tomorrow” (or “Rinse, Repeat,” or whatever they’re calling it this week) know she can be a ferocious action heroine on her own. “Sicario” sets her character up as a moral and narrative center and then pushes her to the side; it’s the film’s statement, apparently, that righteousness doesn’t belong in this battle, and maybe women don’t either. Some reviewers have taken the bait-and-switch as a brave, even subversive move: It’s not Chinatown, Jake, it’s worse. It’s Juarez, and no place for heroes. Some audiences will be convinced, especially in the final scenes, when the meaning of the film’s title (the Spanish word means “hit man”) is revealed at last. But the dark nihilism of “Sicario” masks a reliance on easier solutions, ones we’ve been fed by decades of genre films and that feed our need for justice dispensed with violent, vengeful directness. The movie promises to clear the fetid air around the drug wars. In the end it’s just another drug. Directed by Denis Villeneuve. Written by Taylor Sheridan. Starring Emily Blunt, Benicio del Toro, Josh Brolin, Daniel Kaluuya, Victor Garber. At Boston Common, suburbs. 121 minutes. R (strong violence, grisly images, language). In English and Spanish, with subtitles.